Hi Readers! The other day my brother-in-law asked me if I ever got really “down” about our culture. I told him that usually I don’t — I get so mad about ridiculous rules and outlandish fears that I just blog in a blind fury and feel better. If this is concern, I’ll take neglect. – L.
Read the rest of it here. And weep wherever you’d like. And then sign this Change.org petition. — L.
Dear Free-Range Kids: It’s been a beautiful week in upstate New York, with temperatures nearing 60 mid-week. But students in my school district cannot play on their school playgrounds. In January, the Saratoga Springs School District announced that all school playgrounds would be closed until sometime in April, since the cushioning material under climbing structures is frozen and therefore deemed unsafe. Ironically, the safety material we installed–and I’m sure it wasn’t cheap–is unusable for up to five months of the school year. According to our district safety specialist, there is no approved playground surfacing material that is safe to use during freezing weather. If a school has outdoor space without climbing structures, they can use that for outdoor time (for instance, a basketball blacktop), but my 9-year-old daughter’s school does not. So that means she has “classroom recess” day after day. She’s given up on trying to find some way to play, and she sits at her desk and finishes schoolwork. They have a brief (less than 5 minute) recess in the gym before lunch, and they have gym class twice a week. But otherwise, they have no outlet for their energy. After Girl Scouts this week, the adult leaders were exhausted–they couldn’t figure out why the girls were bouncing off the walls, unable to sit still and do an activity. It seems pretty clear to me that the loss of recess is the culprit. I can’t imagine what it’s like in the classrooms day after day, and I feel very sorry for the classroom teachers. If they cannot invent–and supervise–an indoor activity (Zumba videos on the SmartBoard? ), their students will be increasingly restless, irritable, and unable to concentrate. After a difficult discussion at a PTA meeting, our principal has promised to try to come up with alternatives to playground play. But the district will not budge on re-opening the playgrounds while it is still winter. Keeping students off the playground may prevent one or two falls, and I’m sure it reduces liability. But it creates far more risks than it avoids. Lenore here again: Readers, has anyone out there researched this? Is standard playground safety cushioning truly UNsafe in cold weather — like, less safe than blacktop? Or do the manufacturers warn that it is, so no one can sue them if a kid falls down? Anyone familiar with this issue and can give us some insight or solve this district’s problem? Since when do we let kids play outside in the winter?!? Hi Folks! This is my piece that ran in last week’s Wall Street Journal. Have a good week (and some “vigorous activity”). – L.
Can you imagine that? Children spending 97% of their day not running around? It’s like a desk job, except with cookie time. Excuse me—apple time. When you consider that three-quarters of American kids aged 3 to 5 are in some kind of preschool program and a lot of them come home only to eat, sleep and go back again, this is beyond sad—it’s bad. Bad for their bodies, their brains, their blubber. Baddest of all are the reasons behind this institutionalized atrophy: The quest for ever more safety and education. “Injury and school readiness concerns may inhibit children’s physical activity in child care,” writes pediatrician Kristen A. Copeland, lead author on the study, which will appear in next month’s Pediatrics but is already available on the journal’s website. Let’s take a look at both these concerns, the twin fears haunting modern-day childhood. Fear #2: Falling behind. The trembling triumvirate of child-care providers, parents and regulators also worries that kids must perform at a certain level when they reach school, so play time is sacrificed for academics. Some parents specifically request that their kids not participate in outdoor activities but “read a book instead”—an attitude that spans the economic spectrum. The funny thing is, if you are really concerned about children’s health and school-readiness, there is a very simple way to increase both. It’s called playing. Kids learn through play. When kids play, they’re not wasting their time. They’re learning everything from motor skills to social skills and numbers. Think of all the counting that comes with hopscotch, or with making two even teams. Those activities are a lot more fun than flash cards, but they teach the same thing: math. Kids playing outside also learn things like distance, motion, the changing of the seasons—things we take for granted because we got time outside. But many of today’s kids spend all their daylight hours in child care. Then there are the social skills. The planning (“I’ll throw the ball to you, you throw it to Jayden”) and the compromise (Jayden always wants to go first), and the ability to pay attention. These are key lessons for anyone about to go onto another 12 years of education, not to mention another 50 years of meetings after that. And on the physical side of things, kids outside literally learn how to move. Joe Frost, a professor emeritus at the University of Texas and author of 18 books on child’s play, has been watching for decades as dwindling time outside and increasingly insipid equipment got to the point where many 21st-century kids “are unsafe on any environment, because they have not developed the strength, the flexibility, the motor skills that come with being a well-rounded child.” They don’t even know how to fall safely, which makes them more likely to hurt themselves. 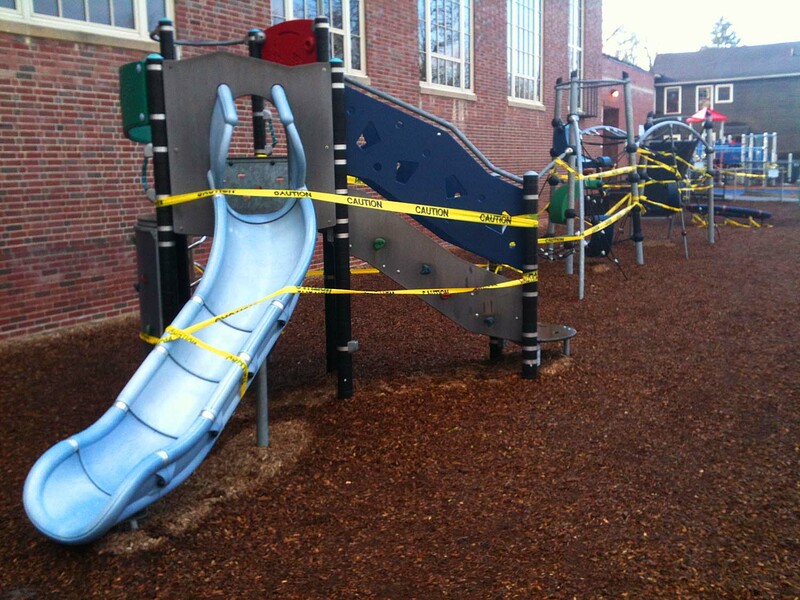 So much for making kids safer by limiting their playground time. As for the biggest health risk of all: 19% of kids are showing up at kindergarten already obese. They’ve started out on a life of couch potato-dom. Some don’t even know how to skip. “We’re seeing what we used to call ‘adult’ diabetes in children as young as 3, 4, 5,” says Dr. Copeland. In striving to make our kids super safe and super smart we have turned them into bored blobs. Fortunately, the remedy is as simple as it is joyful: Just see the playground the way kids do. Not as an academic wasteland. Not as a lawsuit waiting to happen. Just the very best place to spend a whole lot of time.